After the recent controversy with the Indian Air Force, Aamir Khan's Rang De Basanti has met with resistance from the Animal Welfare Board. But while the IAF cleared the film after three suggested cuts, the AWB�is less accommodating. So, 20 seconds of Rang De Basanti has been edited out. 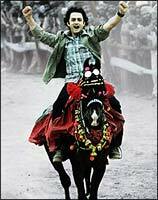 The deleted scene sees Aamir riding a horse during the Nihang Festival celebrated by Sikhs. The AWB found the scene objectionable as�it felt that proper permission had not been taken before the shooting. Flanked by the producer of the film Ronnie Screwvala, Mehra said that the release of the film was postponed by a week and will now release on January 26, instead of January 20. "In a way, we are at an advantage by this delay,�because we get a long weekend ahead," said Screwvala. Rang De Basanti first courted controversy when it was rumoured that the film showed the�defence ministry in bad light. Defence Minister Pranab Mukherjee, along with senior personnel from the armed forces, sat through a special screening of the film. But later, they gave it a green signal. Then it�was reported that Kavita Gadgil, mother of Abhijit Gadgil -- an IAF pilot killed in a MiG crash�-- was not even consulted before the making of film, even though the film is based on his story. Madhavan plays Abhijit Gadgil in the film. Mehra clarified that Gadgil had no objection with the film and all the reports of her objecting to Rang De Basanti were baseless. Abhijit, a�27-year-old pilot, died during a routine training exercise on a MiG-21 near Bikaner in Rajasthan on September 17, 2001. His death became a national issue after his mother fought his case posthumously by stating that her son was not responsible for the crash, and that the MiG aircraft he was flying was faulty. "The film is not about MiGs and air force planes, but about�the youth of India and how they evolve in life," Mehra explained. Screwvala put the blame squarely on journalists by saying, "A non issue was made an issue by the media." Reporters pointed out that they had tried to contact Screwvala, but failed to get a response from him. His reply was: "We got the final clearance from the Animal Welfare Board on the evening of January 14. So how could we comment on the issue when we were in the dark ourselves?"